What's this? No cake? But hold on, who's that coming in through the storm? It's Clare, isn't it? With more supplies. Clare you are a marvel. Your sultana cake and madeira cake eked out the last of our meagre supplies at the Poplar Festival in Bartlett Park on Saturday where we were helping to celebrate 60 years of the Lansbury Estate. The theme was positively 1950s as we shared our tent with the 1950s Museum and tombola while our Lady Luck Jive regaled us with dance vibes while the sun shone. There was a steady flow of customers until the rain poured down, the crowds poured in and Clare came to the rescue. All this after running our annual stall the week before at St Barnabas Fete where we served up cream teas and biscuits. Many thanks to all the excellent women who helped put at both events. We are really grateful and hope you enjoyed yourselves too. 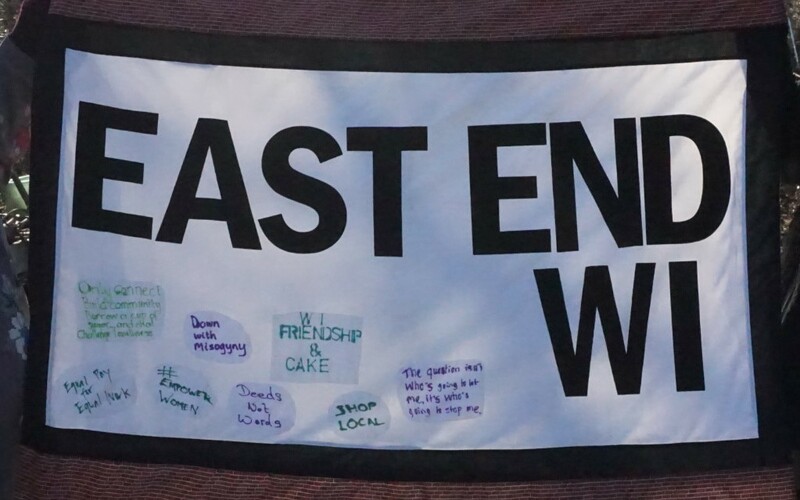 If you would like to come and help out on one of our tea and cake stalls we have one more event coming up for the Battle of Cable Street celebrations on 1st October, 12 - 5pm in St George's Gardens. It would be lovely to see you.